How Will The PlayStation 4 And Vita Interact? 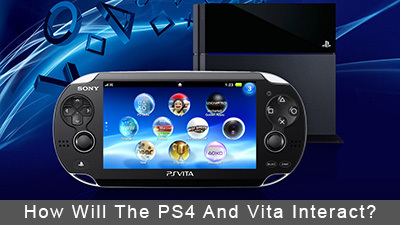 » How Will The PlayStation 4 And Vita Interact? The PlayStation Vita has long been known as a "black sheep" of the handheld consoles, its sales trailing the Nintendo 3DS month after month. With the launch of the PlayStation 4, Sony looks to change that by making the Vita an essential companion piece for the PlayStation 4 in three different ways. Last generation, we saw every console developer copy Nintendo's motion sensing push as Sony unveiled the PlayStation Move and Microsoft unveiled the Kinect. This generation, Nintendo's big innovation is its GamePad, a controller with a touch-based screen in the middle. While Sony hasn't copied that idea with the DualShock 4, it is integrating the idea into the PlayStation Vita, as the device will act as a second screen for games that support it. For example, the Vita can act as an always available map, or it can be used to call in an airstrike without having to access additional menus. The Vita will never be required for any game, but will definitely enhance them. Remote Play existed last generation between the PlayStation 3 and the PSP, but the idea was never fully utilized to its highest potential. With the PlayStation 4 and the Vita, Sony is looking to change that in a big way. For starters, Sony is promising that almost every PlayStation 4 game will be accessible on the Vita via Remote Play. If you're asking "What is remote play? ", think of it as a way to play PlayStation 4 games on your Vita, enabling you to play any PS4 game while out and about. If you're drooling at the thought of a portable PS4, Remote Play via the Vita is the next best thing. The PlayStation App is the third major way the Vita will interact with the PlayStation 4. While the app will include some of the functions of a second-screen device, it will also enable you to access your PlayStation 4 when away from the house. For example, you'll be able to use the PlayStation App to purchase items from the PS4 store, enabling you to never miss a sale on the PSN just because you're away from your console. The app will also enable you to talk to your PlayStation Network friends, check your trophy lists and view which games are releasing this week, among other features. The app is also available on iOS and Android mobile devices.